Vaikasi Visakam in May-June, Aadi Kruthika in July-August, Tirukarthikai and Mondays in November-December, Navarathri in September-October, Margazhi Tiruvadhirai in December-January, Shivrathri in February-March, Panguni Uthiram in March-April and Pradosha days – 13th day of new moon or full moon days – are the festivals of the temple. River Vaigai flowing opposite the temple though eastwards in other parts of the place, flows northward near this temple as Ganga in Kasi, hence called Uttharavahini. 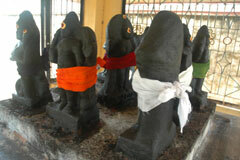 The place therefore is considered equal to Kasi (Varanasi) in religious importance. 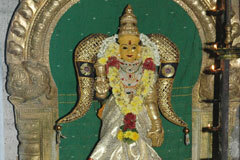 The temple is open from 6.30 a.m. to 10.00 a.m. and from 5.00 p.m. to 8.00 p.m. This is the birth place of His Holiness Sri Sachidananda Bharathi Mahaswami, 25th Pontiff of Shri Sringeri Sharada Peetam from the year 1623-1663. He is also the author of the history of his predecessors, 24 Peethaipathis of the Mutt and has also authored songs in praise of Mother Sri Meenakshi of <?xml:namespace prefix = st1 ns = "urn:schemas-microsoft-com:office:smarttags" />Madurai. There is a special Mandap for His Holiness near the temple. During the special festival dedicated to Him on the Aavani Rohini Star Day (August-September) special abishek is performed to Lord and Mother with Ekadasa Rudra Japa Yagna. It is also noteworthy that this is the birth place of the great scholar Sri Aranga Krishna Sastri who edited the first Sanskrit-Tamil Disctionary. Devotees pray here for freedom from fear of death and salvation bathing in the <?xml:namespace prefix = st1 ns = "urn:schemas-microsoft-com:office:smarttags" />Vaigai River. People pray to Mother Visalakshmi for remedy from diseases and adverse planetary aspects and especially for relief from snake planet aspects. Devotees offer grass (Arugampul) garlands to Lord Vinayaka. Those suffering from prolonged illnesses perform abishek to Lord with ghee lamps and offer sweet porridge or pudding or other sweet preparations to Mother Visalakshi. As Mother-Goddess is more prominent here, people know the temple only as <?xml:namespace prefix = st1 ns = "urn:schemas-microsoft-com:office:smarttags" />Visalakshi Amman Temple. The main entrance is also before Her shrine. Those facing snake planet aspects and obstacles in marriages offer Red Vastras. A garland used for Mother is given as Prasad to the devotees who worship the garland as Mother in the faith that a wedding would materialize soon. They also worship Lord Vinayaka under the Vilwa tree with Ashta Nagas (eight snake idols) for relief from snake planet aspects and also for remedy from Rahu-Ketu adverse aspects. While River Vaigai was once in spate, a Nandhi (bull vehicle of Lord Shiva) and a right mouthed conch (Valampuri Changu) were cast ashore the river. 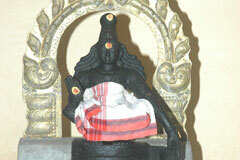 The Nandhi is installed in the temple before the Lord’s shrine. The conch is used for the abishek on Pradosha days and Karthikai Mondays. 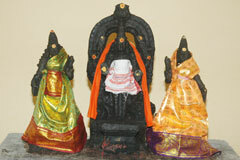 Sankaralingam found in Vaigai is installed in the prakara-corridor. 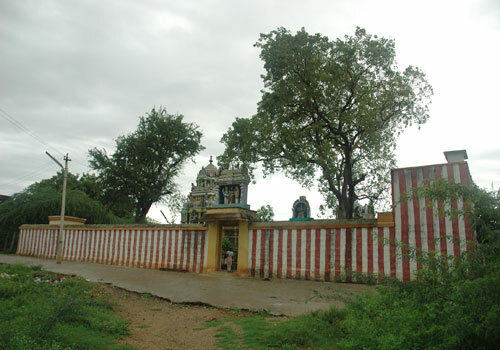 There are shrines for Lord Vinayaka, Lord Muruga with His consorts Valli and Deivanai, Navagrahas the nine planets, Kala Bhairava and Sun in the Prakara while Lord Dakshinamurthy graces from a separate shrine. A Shiva devotee residing in the place followed a principle so strictly to have his food only after feeding a Shiva devotee. He could not find one on a day. He sent his servant to find one. 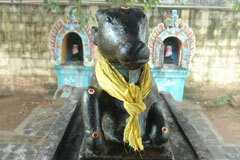 The servant found one bathing in the river Vaigai and invited him for lunch to his master’s house. 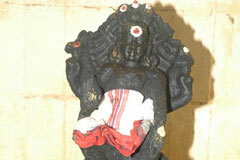 The devotee said that he would accept his invitation after a darshan of Lord Shiva in the temple. 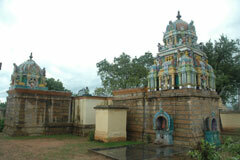 There was no Shiva temple in the place. The devotee angrily said that he would not accept the hospitality of any one residing in a place where there is no temple for Lord Shiva and went away. 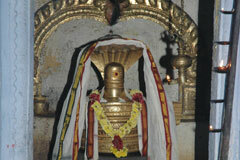 The distressed host devotee immediately went to Kasi, brought a Linga and installed It in the temple he built. Later, Mother Visalakshi was added in a special shrine. 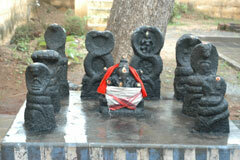 Devotees from Madurai should reach Usilampatti (36 km) and then take Batlagundu bus to reach Kannapatti 18 km far.